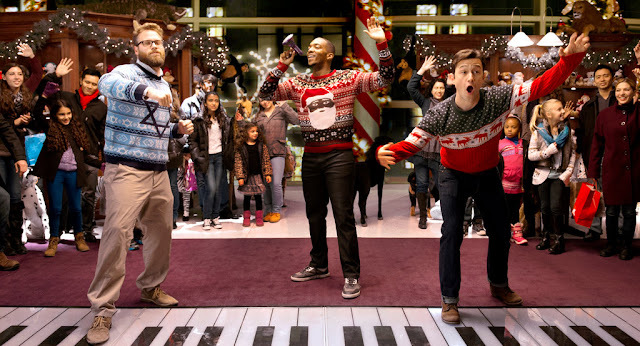 The Night Before stars Joseph Gordon-Levitt, Seth Rogen (also a producer), and Anthony Mackie as childhood friends with an annual tradition of tying one off every year on Christmas Eve. The drug-fueled film starts as the trio slide into adulthood and decide to end the fourteen-year-long tradition with a bang and one final night of festive hard partying. As predicted, all sorts of cinematic debauchery and shenanigans proceed from there including a turn of magical realism. 50/50 director and collaborator Jonathan Levine co-writes/directs the holiday stoner comedy with enough style and verve but clearly has high ambitions for referencing and paying off years of better classic Christmas films. Rogen delivers a big, incredibly hilarious performance as a responsible father-to-be who gets increasingly higher and higher throughout the night, letting his paranoia take over. There's a fun chemistry between the trio, but a heartbroken Gordon-Levitt is saddled with some downer, heavy material that we never really buy into as Mackie's famous athlete character is suitably amusing. It's really Michael Shannon, whose painfully funny and restrained performance steals the film, that livens the festivities up every time he appears on screen as a shady, ultra serious drug dealer. Another standout is Jillian Bell as Rogen's well-meaning, pregnant wife, who like Rose Byrne in Neighbors, is an active part of the debauchery and encourages the guys' behaviour. Lizzy Caplan, another Freaks and Geeks cohort, is once again left with batting cleanup and playing the reasonable love interest but charms through. Mindy Kaling, Ilana Glazer, and especially Miley Cyrus playing herself show up to pad the comedic hay. The Night Before is a wildly uneven but sweet and raucous comedy about brotherhood and men behaving badly. It's so genuinely funny in many moments while the film as a whole desperately tries to overcome its clunky over plotting and scripting by Levine, Kyle Hunter, Ariel Shaffir, and Evan Goldberg. While not exactly a holiday comedy classic, the film has plenty of laughs and fun characters.